San Francisco is in the midst of a war, but it’s not about culture. Over the past few months, stories about San Francisco have become ubiquitous in the national media. Everyone wants to weigh in on what’s being called the San Francisco “culture war.” Last week, PBS News Hour became the latest outlet to report on a city facing extreme income inequality, a dearth of affordable housing and an increasingly intense dispute over how the local government should react to the influx of tech companies and tech workers. The conduit for telling this story was everyone’s favorite symbol: the Google bus. 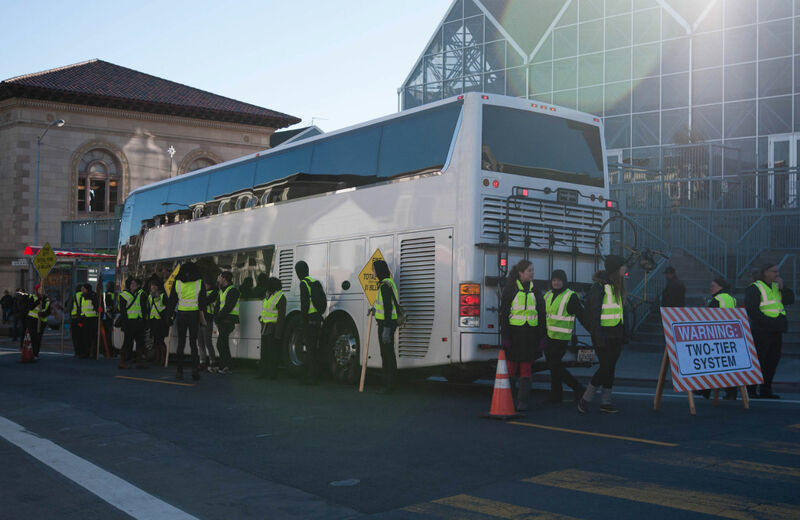 The Google buses (what residents call the chartered shuttles that transport San Francisco residents to their jobs at tech company campuses in Silicon Valley) is irresistible to journalists. I’m no exception: my first article after quitting my former job to become a reporter was about Google buses. I attended a hearing of the San Francisco Municipal Transportation Agency packed with more reporters than that room has probably ever seen. The image of Google buses rolling through the narrow streets of the Mission, tinted windows reflecting scenes of the neighborhood’s vaunted Latino culture—murals, vegetable stands, street vendors, pupusa joints—makes manifest the division between the people inside (tech workers) and the people outside (everyone else). In this supposed clash of cultures, the Google Bus represents neoliberal disruptive innovation: the private sector accomplishing what the public sector is too incompetent to do itself. The working-class Latinos waiting at the same bus stops for public transportation are the old San Francisco, creators of the old culture that’s being forced out. The PBS report is just one example of a serious problem with the media’s desire to cast what’s happening in San Francisco as a “culture war.” In an almost eight-minute segment, the Mission’s Latino residents are seen but not heard. They are filmed in background shots establishing the milieu of the neighborhood, but only white San Franciscans are interviewed. Focusing on culture distracts from the material realities being faced by working-class San Franciscans, many of whom are people of color. By romanticizing the aesthetic output of San Francisco’s immigrant communities, the media ignores their humanity, their agency and the actual harm being done to them. The culture is the product of the people, but those people are not being heard. The emphasis on culture has also led to distortions in the representation of what is actually happening in San Francisco. The tech sector is an important and rapidly growing part of San Francisco’s economy, but it still only employs 6 percent of workers in San Francisco. The tourism, healthcare and construction private sectors each employ more San Franciscans than tech. You would have no idea of that fact from most media coverage. Culture doesn’t account for the peculiar realities of formulating a budget in a state where California’s Proposition 13 has placed severe restrictions on the ability of cities to raise tax revenue for almost forty years. It doesn’t address the fact that San Francisco’s housing shortage is exacerbated by the unwillingness of surrounding municipalities to build denser housing within their own borders. It doesn't explain why a recent study found that African Americans, a population already declining dramatically in the city, are being targeted for eviction at a disproportionately high rate. There is more going on here than a clash of cultures. In some ways, the media’s treatment of San Francisco’s working-class communities of color as window dressing mirrors that of the gentrifying young professionals moving to their neighborhoods. The cultural output of an immigrant community is part of the draw for people turned off by the sterility of bedroom communities in the suburbs. People want to be close to the restaurants, the murals and the street festivals. (They don’t want to be subject to the same lack of resources and civic neglect that led poorer communities to settle in those areas before, however, and they don’t want to deal with crime or visible poverty.) The murals will stay on the walls as long as no one paints over them, but the people who painted them will have to go. I don’t mean to condemn all of the journalists covering San Francisco. Many are doing great work providing a nuanced understanding of the complicated forces at play in the city. But please, no more talk of a “culture war.” People are fighting for their right to remain in homes and communities they’ve worked hard to build. That isn’t culture. That’s capitalism.